Thanks to the goofy advertisements for his New Jersey Hyundai dealership, Brad Benson is remembered for more than just his former career in the National Football League. In radio ads that began last fall, Brad Benson -- then Hyundai's second-best-selling U.S. dealer -- pledged to remain celibate until his store in rural New Jersey regained the top spot. Benson, 54 and married, can breathe a little easier now. For the first month this year, his South Brunswick, N.J., store outsold all other Hyundai outlets in October, and the ex-New York Giant's off-the-wall advertising has a lot to do with his success. For several months, Benson kept things interesting on the airwaves with ads about his love life -- or lack thereof. Then he rolled out a new campaign, with a similarly risque theme. "If I was to tell you that you could come visit our dealership to see my 40-foot erection," Benson asked in a radio spot, "would you think I was just another car dealer making an exaggerated claim? "Well, check it out. 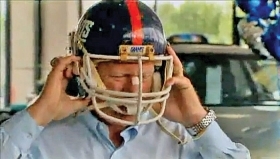 I just bought one of the goal posts from the old Giants Stadium that they're tearing down, and I've erected them right here at the dealership." Benson's commercials aren't all risque. But most range from slightly askew to downright bizarre. Like offering Saddam Hussein a free car a few years back if the Iraqi dictator would step down. Other spots have skewered politicians, celebrities and professional athletes in the news. It's all part of a madcap advertising strategy that he says helps his dealership "cut through the clutter." He sells an average of 405 new Hyundais a month, almost seven times what the store sold before he began running the off-kilter commercials seven years ago. Benson was Hyundai's top monthly seller five times in 2009. Through October, he is about 700 units behind Hyundai's No. 1 store, Atlantic Hyundai of West Islip, N.Y.
How does Benson, who was the starting offensive left tackle for the 1987 Super Bowl champions, come up with this stuff? Well, he's always thinking. After deciding last spring to install the goal posts from the old Meadowlands stadium, he wondered if any zoning issues would come into play. "I said to someone, 'This will be a 40-foot erection when I put these things up' -- that's it!" he recalled. "A 40-foot erection! Oh my god, that's my next ad. It follows up the celibacy ad perfectly." Hyundai executives in Southern California have taken notice. "We sort of wince a little bit when we look at some of the campaigns," said Dave Zuchowski, Hyundai Motor America's head of sales. "But we certainly don't dispute the results." Today Benson is finishing a major renovation to add 8,000 square feet to his 18,000-square-foot dealership. The expansion will include a dedicated space for Hyundai's $60,000 Equus luxury sedan. He also is adding about four acres to the dealership for more parking and inventory as Benson expects Hyundai's upcoming redesigned Elantra to boost sales by about 100 units a month. But business wasn't always this good. The dealership lost money for years after he acquired the franchise in 1997. Averaging about 60 new Hyundai sales a month, Benson couldn't support the overhead costs on his eight-acre facility. Things got so tough that Hyundai sent him a letter in 2003 warning that he needed to improve or lose the franchise, Benson says. He and his sales and general managers met to come up with a game plan. Benson's managers suggested having a big sale, backed by $100,000 in radio ads. "I'm not going to spend this much money unless we have a real message, and it can't be the standard car dealership message of, 'Come down here. We'll make you the best deal,' " Benson recalled telling his managers. "I just felt like we had to do something. So we decided to give a car to Saddam Hussein if he got out of Iraq." In April 2003, Benson ran a radio ad in which he declared his presidential candidacy and promised to solve America's foreign policy troubles. The U.S. military had just invaded Iraq after Saddam Hussein had balked at President George W. Bush's ultimatum to leave the country or face an invasion. In the ad, Benson said he would give the dictator a new Hyundai every year for life in exchange for his leaving Iraq. When he saw how much the ads boosted sales, he knew he was on to something. And sales have been on the rise ever since. After averaging about 60 new Hyundais a month before starting the Saddam ads in 2003, Benson's sales are up almost seven-fold. During cash for clunkers in August 2009, he sold 623 new cars. Benson's nonclunkers monthly sales record is 537 new cars, he says. "What started out as a necessity to separate ourselves has become our marketing strategy," Benson said. He is heard throughout New Jersey as the voice of his dealership's off-the-wall radio ads that run once an hour during drive time periods on two of the region's biggest stations. Recently, Benson launched his "International Idiot" award. A September spot lampooned Terry Jones, the Gainesville, Fla., pastor who drew criticism for his plan to burn the Koran on Sept. 11. "Reverend, you're the winner of this week's International Idiot award," Benson said in the ad. "Your prize? Well, if you stop all this Koran burning nonsense -- for good -- and go back to handling snakes or whatever it is you do down there, I'll give you a brand new Hyundai to use for a whole year, you idiot." After Jones backed down, Benson made good on his offer. Jones personally took delivery of the car, a 2011 Hyundai Accent, at the dealership on Oct. 22. Jones plans to donate it to a shelter for battered women, Benson says. According to the Associated Press, Jones said Benson's offer was not the reason he decided to cancel the Koran burning. The pastor said he did not hear about it until a few weeks after Sept. 11. Benson spends about $2.4 million annually on radio advertising. Ever since the Saddam Hussein spot, ads for his dealership have been in heavy rotation on the New Jersey airwaves. "You have to be hitting it hard for six, seven or eight months to really evaluate the effect, and you have to be patient," Benson said. "The point is, even when you think you're really nailing it, people can still miss it." 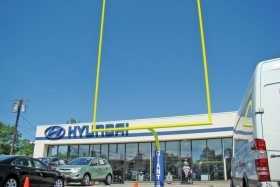 When Brad Benson bought and installed one of the goalposts from his old home field, Giants Stadium, at his Hyundai store, he used yet another of his off-kilter commercials to brag about his, uh, acquisition. The 6-foot-3 Benson wasn't a major football prospect coming out of Penn State. He was picked in the eighth round of the 1977 NFL draft by the New England Patriots -- the 219th choice overall. Quickly cut by the Pats, Benson was picked up by the Giants midway through the 1978 season. He eventually earned a starting spot and remained with the team until he retired after the 1987 season. Unlike the players who earn huge salaries in the NFL today, Benson says he made less than $50,000 a year in his first three years in the league and never more than $200,000 in a single year. "When you're in that situation, you've got to have some plans to get into business and make money when you're done playing," Benson said. While in the NFL, Benson befriended Gerald Lustig, a New Jersey Honda and Acura dealer. Benson would give Lustig tickets in exchange for use of a car when he was in town. Benson says he frequently would refer acquaintances to Lustig's dealerships. The two went in as partners and bought a small Jaguar dealership in Edison, N.J., in 1986, while Benson was still in the NFL. The dealership, which now houses a tire store, sold only 10 cars a month. "It wasn't big -- it couldn't get away from me," Benson said. "I had no experience. It was the perfect way to learn the business." He acquired a Mitsubishi franchise in the early 1990s after building the 18,000-square-foot showroom where his Hyundai store stands today. He sold the Jaguar store in the mid-1990s and acquired his Hyundai franchise in 1997. Zuchowski calls Benson a "larger than life" character, one whose sense of humor, football fame and dedication to the business have created a winning combination. Many of Hyundai's biggest dealers are seeing impressive growth, Zuchowski says. But Benson's situation is different. Said Zuchowski: "To go from 1,000 cars a year to 4,000 or 5,000 cars per year is pretty unprecedented when you don't change the operator." Benson says there's more to his success than just his advertising style. "You can't go out and advertise like this and not have the right people here," he said. "We have one of the most progressive sales forces in the business." David Cantin, the dealership's general manager, said he runs "the most disciplined showroom for a salesman and a manager to operate in." Cantin says the sales reps operate like a tightly knit offensive line, greeting each customer in the same way, offering every customer a test drive and using the identical system for qualifying buyers for financing. In 2006, the dealership began offering an across-the-board "30 percent discount" to its customers. The discount promotion was designed to reduce showroom haggling. Benson credits it with helping convert shoppers drawn by his outlandish ads. The heavy spiffs help move the metal, and by making use of Hyundai dealer incentives and the store's solid finance and insurance department, Benson says his store stays profitable. "We're into the Hyundai money," he said. "We've got to hit our plateaus."